How did carpenters measure in 1797? What does Asher Benjamin assume his readers know when he writes his first pattern book? Instructions today for building a simple bookcase - for example - assumes the carpenter will use a tape measure and a steel carpenter's square. By comparison, in 1797, a carpenter had a square and perhaps a folding rule. He also had dividers and a compass. He used both to determine dimensions. 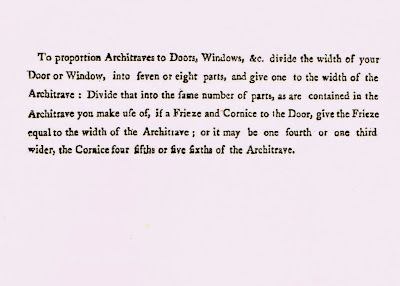 Here are Asher Benjamin's instructions for the moldings around a door (at the end of the descriptions for Plate 1). Click the picture to enlarge it - for easier reading! He gives no dimensions, just ratios: 'seven or eight parts', 'one fourth or one third wide'. 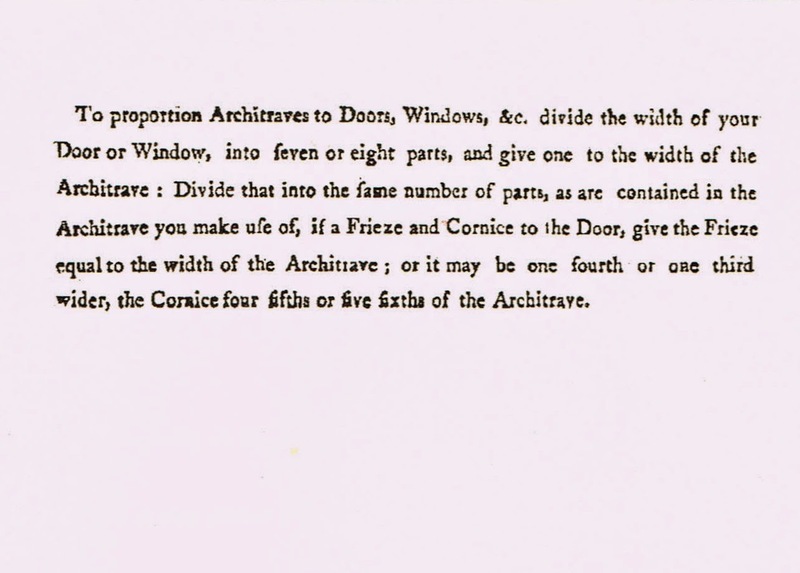 The reader would have used his compass and dividers to layout the geometry, to divide a door or window width into 7 or 8 parts. 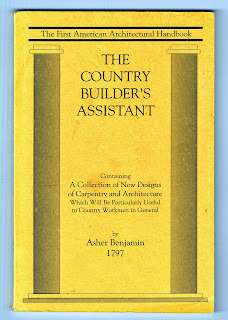 When Asher Benjamin writes his books, we were still making the parts for a house specifically for that house - no buying off the shelf. When it came to finish work, each molding added at a door opening or chair rail was made to order, regardless of how it was measured. Uniform measurements for construction were not necessary until people wanted interchangeable parts. If your yard was 36" and mine was 35" it didn't matter. Benjamin's introduction to geometry - his first plates - and his descriptions of how to draw the profiles of various moldings show his readers to how adapt his patterns to their specific buildings. 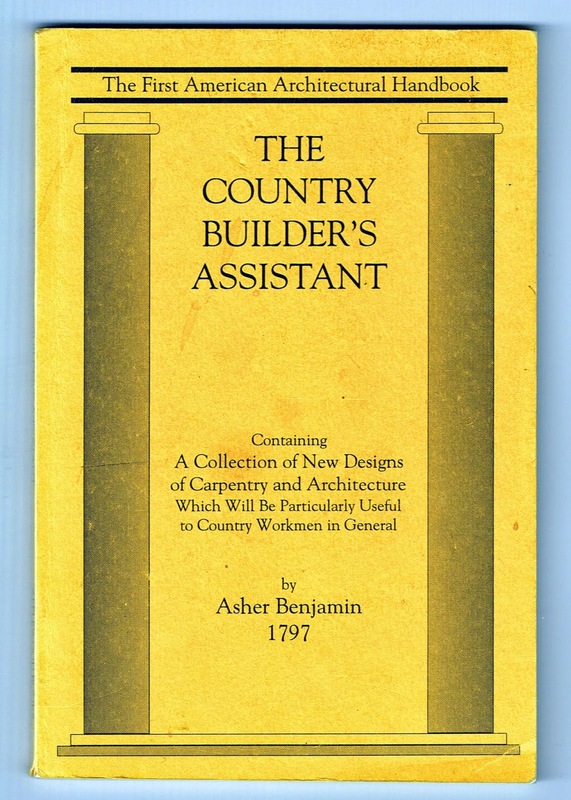 The Country Builder's Assistant, by Asher Benjamin, 1797, shown above, is a reprint by Applewood Books, Bedford, Massachusetts, 1992. The originals, (worn. well used and well loved!) are often available in rare book libraries.